I am no expert in Arabic grammar, but the latest confusion caused by a threat by Iraq’s prime minister Nuri al-Maliki to dissolve parliament is so simple to clear up that even I can do it. Apparently, the culprit are English versions of the Iraqi constitution and in particular a mistranslation of article 64 which governs dissolution of parliament. It should be emphasized at first that English versions of the Iraqi constitution cannot be relied upon since there is not an official one. Their only value is that they may be faster to skim through for an English-speaking reader if something needs to be located fast, whereupon the relevant part of the Arabic version should be consulted. “Parliament is dissolved or a request from the prime minister and the president.” The preposition “by” is lacking. This sentence wouldn’t have passed a secondary school exam and it cannot be the Iraqi constitution. If the intention had been to give the prime minister the right to dissolve parliament with the mere consent of the president, the relevant clause would instead have read aw bi talab min rais al-wuzara. But it doesn’t. It just says aw talab min rais al-wuzara. In this case, the preposition “by” (bi) is exclusively linked to the “absolute majority” of the parliament. This makes it clear that the prime ministerial involvement relates to the procedure for introducing the motion about parliamentary dissolution to parliament itself, which in turn will make the big decision about dissolving the assembly. At any rate, at this point there is nothing to suggest that Maliki’s comments should be seen as anything more than a threat (“he feels forced/under pressure to call early elections”). There is no indication that there is even presidential agreement to introduce the motion to parliament, and in any case Maliki would probably be unlikely to win it. He probably knows it; why would Iraqi parliamentarians risk their own privileges? The more worrying point is the tone of Maliki’s comments after meeting with Ibrahim al-Jaafari last Sunday, asking parliament to clean up its act before questioning him. There is much to suggest that Maliki may have a stronger parliamentary base than his opponents claim, but language of the kind he used over the weekend may soon lead to the evaporation over any additional support he got recently from disgruntled Iraqiyya MPs unhappy with the no confidence proposal. Much as his enemies appear unable to muster the 163 votes needed to unseat him, Maliki needs to understand that the implication of this is not that he himself controls 163 votes in the Iraqi parliament. What should they ask about? This is where the problems begin. True to form, the critics of Maliki have reportedly formed no less than three committees to concoct nasty questions to be put to the premier in the parliamentary chamber. One story claims Bahaa al-Aaraji, the Sadrist, will lead the charge! Maliki’s allies cannot be any worse than this and have promised catalogues of files of alleged criminal wrongdoing on the part of Maliki’s enemies that will be revealed during the questioning, thereby changing the dynamics radically – or so goes their scenario, anyway. Few critics of Maliki appear to have taken much notice of a potentially fateful ruling by the Iraqi supreme court some weeks ago which severely limited the ability of parliament to question ministers. Essentially, it said that in order for ministers to be summoned before parliament, there had to be a specific criminal charge or constitutional infraction for which to hold them accountable. The ruling amounted to nothing less than a rewriting of the Iraqi constitution since no such strings are attached there, but Iraqi media have been slow to respond. Importantly, whether one agrees with the ruling or not, it applies to ministers and prime ministers alike since they are all treated on an equal footing in the relevant article of the Iraqi constitution (61-7-c). The ruling was given in the context of the potential questioning of a Maliki ally – Ali al-Adib who is minister for higher education – but some Maliki supporters are already discussing the potential questioning of the prime minister in a similar vein. The obvious question is, will the issues Maliki’s critics want to raise satisfy the new and more restrictive criteria of the supreme court for a parliamentary questioning (istijwab)? Generally speaking, questions about corruption or the failure to provide services are unlikely to succeed simply on procedural grounds. The subjects most likely to meet with approval as suitable subjects for questioning are constitutional infractions on the part of Maliki on very specific issues. Two stand out. 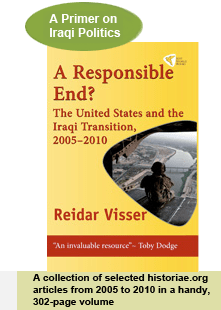 The first is the failure of the Iraqi cabinet, since 2010, to honour the requests for federalism referendums in numerous Iraqi governorates, including Basra, Wasit, Salahaddin and Diyala. This is a very clear violation of the law on forming regions that was adopted in 2006 and promulgated in 2008 as the implementation of article 118 of the constitution and which specifically charges the cabinet with putting the referendums in motion as soon as the requests have been received. At least in Sunni-dominated Diyala and parts of Salahaddin, the pro-federal currents seem to remain alive and as long as the federalists remembered to lodge a formal request for a referendum (alongside all the unnecessary bluster abut “declaring” themselves regions) there is plenty of reasons to ask Maliki what happened to those constitutionally mandated referendums. Article 78 of the constitution charges the PM with administering his cabinet so this is his responsibility. A second subject that could count as a constitutional infraction by Maliki is the failure to have upper-level military officers by parliament, as demanded by article 80-5. Again, the PM has a special responsibility as administrator of the cabinet. Whether any such questioning would succeed in a successful no confidence vote remains unclear. For a long time, the numbers in favour of a direct no confidence vote seemed exaggerated and masked the possibility that they might fall just short of the critical 163 absolute-majority mark. Additionally, if any of the two specific constitutional infractions discussed above come into play, Maliki may still be able to win over additional support. For example, on federalism, while the constitution is clear, Maliki might well be able to successfully use arguments of national unity in the assembly in the same way as he has used them in the governorates (where he has been able to mobilise Sunni tribes on an anti-federal basis and translate this into parliamentary support). In other words, Maliki’s implicit argument for violating the constitution for the sake of national unity may curry favour with at least some MPs. The failure to have high-level military officials confirmed by parliament is an issue which more directly touches on the parliamentary oversight role that lies at the heart of any definition of democracy. Again, though, Maliki might conceivably succeed in winning over at least some potential critics by referring to expediency and the abysmal efficiency record of the Iraqi parliament. Whatever happens, it is to be hoped that the no confidence vote, if requested, is allowed to go ahead as long as there is adherence to the basic constitutional modalities. Whoever wins this process will come out strengthened if the rules of the game are followed as much as possible. Parliament is scheduled to meet again on 21 June. There has been lot of talk about signatures in Iraq lately. Most of it has been focused on a supposed list of signatories who asked President Jalal Talabani to stage a vote of no confidence in Prime Minister Nuri al-Maliki. Late Monday, both Maliki and Talabani confirmed the existence of some kind of petition addressed to Talabani; Maliki asked Talabani to hand the document over to the judiciary to check it for possible forgeries. There are lots of problems regarding these alleged signatures, both at the technical level and in the broader constitutional context. Technically speaking, no complete document of signatures has been published so far. Most press reports deal with aggregate numbers of deputies for each of the blocs opposing Maliki, with only a dozen of independent deputies specified by name. Numbers of signatories vary from 176 to 200 plus. Several of the named deputies, minority representatives and one Kurdish party (Goran) have subsequently protested at their inclusion or specifically rejected the idea of a no confidence vote in Maliki. More importantly though, these signatures – whether they actually exist or not – have no legal or constitutional meaning. There are two ways of asking for a no confidence vote under the Iraqi constitution. Firstly, the president can do so. Importantly, in that case he can do so simply because he feels it is the right thing to do. It doesn’t matter whether he has the signature of every single deputy in the Iraqi parliament or none; it is his decision alone. It should be stressed that there is no need for the president to present any compelling rationale for having the vote. Secondly, a fifth of the deputies in parliament (65 MPs) can also ask for a questioning of the PM (istijwab) followed by a no confidence vote. In that case, however, they need to go directly to the parliamentary speaker (Usama al-Nujayfi). Talabani has no role whatsoever in that route to a no confidence vote. In both cases the vote itself will be settled by an absolute-majority vote of 163 deputies. In other words, the signatures to Talabani are no more binding than an opinion poll. Talabani may listen to them if he likes to, or he may reject them and ask them to work via a 65-member petition instead. This is why it is so strange that Maliki has initiated a procedure of investigation of these basically valueless signatures. One possible explanation is that he may want to pre-empt any possible move by his enemies through embarrassing them with charges of fraud. The different reports of the true number of signatories are in themselves perhaps an indication that there may be problems relating to the verification of some of the signatories. Even if this move by Maliki may seem quixotic, it is certainly preferable to the overtly politicised recent ruling by the supreme court on the right of parliament to question ministers. Iraqiyya claims Talabani has already sent a request for a no confidence vote to Nujayfi. The only thing that is known officially is that Talabani has formed a committee to deal with the question of the authenticity of the signatures. Constitutionally meaningless it all is, but maybe a way of winning time for players unsure about their next move?